As we near the end of the year, we often reflect on and give thanks for the things we have or the things we have accomplished. Some things that we consider may be material, some things may be more ephemeral, others may be short-term accomplishments or some may have been nurtured over considerable amounts of time. Often those things we are most proud of are things we have nurtured, contributed to, or that we have given of ourselves to achieve. One of the benefits of working with a non-profit organization is that we are often part of those larger efforts by such a diverse community. I've often repeated that nothing NISO does as an organization could be accomplished without the support and contributions of a diverse and engaged base of contributors. It is so true. From the working groups that develop technical solutions to information exchange problems, through leadership committees that direct working group efforts, to education committee members who support our training efforts, NISO relies on the contributions of hundreds of volunteers. We hope that each of them will reflect warmly on their accomplishments and efforts over the past year. The NISO staff and the NISO Board of Directors certainly appreciate their efforts. The wider community appreciates the value that NISO standards make in simplifying their information exchange and retrieval efforts, even if they might not recognize the efforts that go into making these standards they use. So on their behalf, I'd like to extend thanks to all those that make NISO and our work as vibrant as it is. 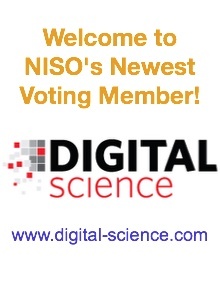 Among NISO's many successes, I am most pleased about the steady stream of new members joining our community. Thirty-five organizations have decided that the value we contribute is meaningful enough to support financially and have become LSA or Voting members of our Organization. We have provided educational training to literally thousands of professionals in our community, with some of NISO’s most successful events ever taking place during this past year. 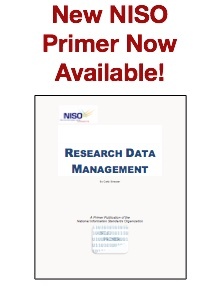 Related to education, NISO released the first of a new series of introductory Primers, with the first on Research Data Management; others are in the works. On the standards front, NISO launched several new projects including an important new initiative on patron privacy in publisher and library systems supported by a grant from the Andrew W. Mellon Foundation. 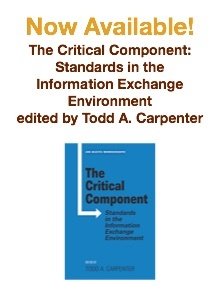 To support the creation and distribution of standards, a new standard markup for technical standards project was launched, as was a project to support standards for bibliographic vocabulary exchange, and the revision of the seminal ANSI/NISO paper permanence standard. NISO also took over maintenance of the Transfer project from the UKSG. Finally, we published three new standards documents; one on Access and License Indicators, a new recommended practice, Protocol for Exchanging Serial Content, and a draft technical report on SUSHI-Lite. Particularly as we list off the various accomplishments, it certainly has been a very busy and productive year. It appears as though things are lining up for the coming year, with some big announcements next month. I hope you can join us in Boston in January for our annual meeting and update report at the ALA Midwinter Conference where we will report out on all of these activities and others. We wish you all the very best for a terrific end to 2015 and hope that you all have a productive and successful new year! Academic Print Books Are Dying. What's the Future? Advancing understanding of technology in the information distribution community is a core element of NISO's non-profit mission. Over the years, thousands of information professionals have participated in our virtual and in-person educational programs. The coming year, NISO will continue to provide a robust schedule of monthly webinar series, virtual conferences, Free webinar events and Training Thursdays. Below is a list of the events scheduled in 2016. Descriptions, and registration information about the programs is posted to the Events page on the NISO website. March 16, 2016	||	NISO 2-part Webinar Privacy: What data is being collected and by whom? All monthly webinars take place between 1:00 - 2:30 EST and are delivered via a WebEx platform. August 31, 2016	||	Data Curation- Cultivating past research data for future consumption. 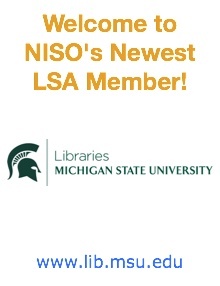 The NISO Library Standards Alliance members receive as a benefit of their membership, the entire series of monthly webinar programming. In addition, they receive discounted subscription rates on virtual conference packages. 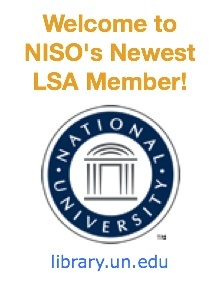 More information about LSA membership is available on the NISO website, or available by contacting DeVonne Parks in the NISO office. More information about the program schedule, including full session descriptions along with subscription packages and registration information will be released later this month. Additional, partner or in-person events may be added later. As we always are in January, NISO is excited to be participating in the American Library Association Midwinter conference; 2016's will be held in Boston at the Convention & Exhibition Center. NISO will be exhibiting at booth #1035 and we invite all our members and friends to stop by. Midwinter also marks the point in the year for NISO to host its annual Member meeting along with a semi-annual Standards Update - this event is open to all and will be held on Sunday, January 10 from 1:00-2:30 pm. NISO staff plans to provide an update/discussion forum on its recent Consensus Framework for Patron Privacy in Library and Information Systems on Saturday, January 9 from 1:00-2:30 pm. Please see our ALA Midwinter page for locations and updates on speakers and further NISO-related sessions. Big Data is the catch-phrase of the day, and for good reason. It appears that everything is being digitized and as such, huge data sets are now suddenly available to researchers and data scientists. But how do they use all of this data? The idea of having anything we need just a few clicks away is exciting, but when the data is not created in a way that is easily searchable and extractable, access is limited. Additionally, there are issues about ownership, management, preservation, and the rights the library offering it may or may not have regarding access. This webinar will discuss these issues and try to find the happy medium between policy and practicality. For more information and to register for this event visit the event webpage. We began offering digital information several decades ago. Today, some of that information has been lost because of the way it was saved. One of the major issues with digital information is creating and preserving it in ways that ensure its availability for generations to come. Unfortunately, this has not always been the case, and there are vast amounts of data that have been preserved but in ways that are no longer readable. This webinar will discuss old technology and the data that is imprisoned on it, and how to set this data free, e.g., how to convert it into formats that render it useful not just to us, but to future researchers. For more information and to register, visit the event webpage. Science is often referred to as a self-correcting system and scholarly communications are meant to play an important role in that process. By describing the work that has been undertaken, others can verify the work by replicating it, testing its validity, and applying it in their own work, thereby building upon it. Recently, questions have arisen about the scholarly record, with revelations about false data, erroneous processes, and irreproducible research. Are there problems with the peer review process that are allowing more faulty research into publication? Is the availability and discoverability of content making it simply more visible to the scholarly marketplace? Once content is retracted, what practices should be implemented to identify retracted materials as such? How is retraction information communicated and are corrections to the scholarly record connected in an obvious way? This webinar will explore ways in which scholars, publishers and libraries are working to ensure the trustworthiness of the scholarly record. For more information about this webinar and to register, visit the event webpage. 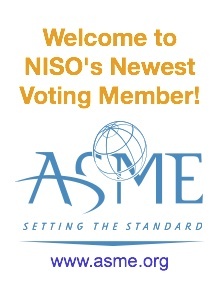 US–based NISO Voting members participate in the development, revision, and evaluation of interniationl ISO standards. Voting members are able to influence the process and mold the future of the industry. The following ISO ballots are open for consideration by Voting members and will close in before the next Newsline is distributed. Systematic Review for Notification of ISO 15706–2:2007 (vers 2) Information and documentation – International Standard Audiovisual Number (ISAN) – Part 2; Version Identifier This part of ISO 15706 establishes a voluntary system for the identification of versions of audiovisual works and other content derived from or closely related to an audiovisual work (see Annex A). It is based on the International Standard Audiovisual Number (ISAN) system defined in ISO 15706. Ballot closes on December 4, 2015. ISO 8784–2 Pulp, paper and board – Microbiological examination – Part 2 Enumeration of bacteria, yeast and mould on surface This part of ISO 8784 specifies a method for determining the bacteria, yeast and mould population on the surface of paper and paperboard. The enumeration relates to specific media. The standard is applicable to all kinds of paper and paperboard, to dry market pulp in sheet form and to packaging material.​ Ballot closes on December 30, 2015. New Work Item Proposal ISO 18461 Key Indicators for Museums This is a TC46/SC8 new work item proposal to develop a new standard Key indicators for museums. An International Standard "Key indicators for museums" is planned as follow-up to ISO 18461 Information and documentation - International museum statistics. It aims at offering a broad selection of tested indicators for evaluating the performance of museums of all types and subjects. Ballot closes on January 6, 2016. "The Internationalization Working Group has published a Working Draft of Internationalization Best Practices for Spec Developers. Developers of specifications need advice to ensure that what they produce will work for communities around the globe. This document provides a checklist of internationalization-related considerations when developing a specification." "The National Cybersecurity Center of Excellence (NCCoE), in partnership with the National Strategy for Trusted Identities in Cyberspace National Program Office, is seeking comments on a new project focused on protecting privacy and security when reusing credentials at multiple online service providers. Many organizations now allow online customers to use third-party credentials to create and manage accounts and services. For example, your social media account login can be used to access your fitness tracker account. In effect, the social media company is vouching for you with the tracker company. Allowing third-party credentials saves businesses time and resources in managing identities. For users, the benefit comes from not having yet another username and password to manage and remember. As these arrangements become more common, a growing number of organizations are laboring to manage—and integrate—each third-party relationship. So now a new service, called brokered identity management, has emerged. Organizations can engage identity brokers to manage multiple third-party credentialing options on their behalf. The benefits to organizations and individuals are significant, but there is also a concern that these connections meant to improve security can create opportunities for increased tracking of users." A draft redesign of How to Meet WCAG 2.0: A customizable quick reference to Web Content Accessibility Guidelines (WCAG) 2.0 requirements (success criteria) and techniques has been recently published by the Education and Outreach Working Group (EOWG) and the Web Content Accessibility Guidelines (WCAG) Working Group (WCAG WG). This tool provides a customizable view of different Web Content Accessibility Guidelines’ (WCAG) 2.0 resources including Web Content Accessibility Guidelines (WCAG) 2.0 web standard; Techniques for WCAG 2.0 implementation guidance; and Understanding WCAG 2.0 supporting information. "ISO/IEC 19788-8:2015 provides data elements for the description of MLR records: sets of data elements describing a learning resource [and resources directly related to that learning resource, e.g. persons (authors, contributors), annotations, learning activities, metadata records, etc.]. It can also be used to keep track of the record editing process including global metadata author identification, last record update, and application profile used for the description of a learning resource. These elements can later be combined with other descriptive elements from other parts of ISO/IEC 19788 or other standards to provide the description of a learning resource and of related entities needed for that description." "This document provides design guidelines for improving the interoperability of emoji characters across platforms and implementations. It also provides data that designates which characters are considered to be emoji, which emoji should be displayed by default with a text style versus an emoji style, and which can be displayed with a variety of skin tones. This document has been reviewed by Unicode members and other interested parties, and has been approved for publication by the Unicode Consortium. This is a stable document and may be used as reference material or cited as a normative reference by other specifications." In addition, the Unicode Technical Committee recently announced that 74 characters are candidates for emoji with a final determination to be made which ones will be included in Unicode 9.0 scheduled for release in June 2016. Hypothes.is, a company which has built an open-source software platform for web annotations that allows users to highlight text or to comment on any web page or PDF file, announced partnerships with more than 40 publishers, technology firms and scholarly websites, including Wiley, CrossRef, PLOS, Project Jupyter, HighWire and arXiv. "The formal partnership announced this week sees some publishers working harder to encourage annotation, including tackling content that annotation systems stumble over, such as page frames and embedded page readers." Annotation has potential to improve and transform classroom instruction and discussion, the peer review process, linking between versions of articles, as well as other areas of scholarly communication. The open-source nature of the hypothes.is platform makes it a particularly powerful tool for adoption. "The print-format scholarly book, a bulwark of academia's publish-or-perish culture, is an endangered species. The market that has sustained it over the years is collapsing. Sales of scholarly books in print format have hit record lows. Per-copy prices are at record highs. In purely economic terms, the current situation is unsustainable. So what does the future look like? Will academia's traditional devotion to print and legendary resistance to change kill off long-form scholarship? Or will academia allow itself to move from print-format scholarly books to an open-access digital model that could save, and very likely rejuvenate, long-form scholarship?" by Micah Altman, Eleni Castro, et al. Code4Lib Journal, October, 2015. "This article describes the novel open source tools for open data publication in open access journal workflows. This comprises a plugin for Open Journal Systems that supports a data submission, citation, review, and publication workflow; and an extension to the Dataverse system that provides a standard deposit API. We describe the function and design of these tools, provide examples of their use, and summarize their initial reception. We conclude by discussing future plans and potential impact." By Jody DeRidder. Code4Lib Journal, October, 2015. "Long-term access to digitized audio may be heavily dependent on the quality of technical metadata captured during digitization. The AES57-2011 standard offers a standardized method of documenting fairly comprehensive technical information, but its complexity may be confusing. In an effort to lower the barrier to use, we have developed software that generates valid AES57 files for digitized audio, using output from FITS (File Information Tool Set) and a few fields of information from a tab-delimited spreadsheet. This article will describe the logic used, the fields required, the basic process, applications, and options for further development." "Over the past fifteen years, our perspective on tackling information interoperability problems for web-based scholarship has evolved significantly. In this opinion piece, we look back at three efforts that we have been involved in that aptly illustrate this evolution: OAI-PMH, OAI-ORE, and Memento. Understanding that no interoperability specification is neutral, we attempt to characterize the perspectives and technical toolkits that provided the basis for these endeavors. With that regard, we consider repository-centric and web-centric interoperability perspectives, and the use of a Linked Data or a REST/HATEAOS technology stack, respectively. We also lament the lack of interoperability across nodes that play a role in web-based scholarship, but end on a constructive note with some ideas regarding a possible path forward."